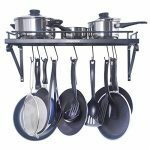 Unenck’s wall mount pot rack adds style to your kitchen; premium wrought-iron construction is highly durable and will help you to save space on storing pots, pans or other cookware. Five rails are here for hanging items by catelogy. 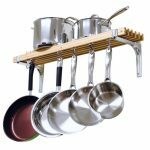 Please buy it with confidence for they are customized by our factory and we always devote to providing best quality to all of our valued customers.✔[SPACE OPTIMIZATION] This pot rack is well designed to be a cookware holder in kitchen or an organizer shelf in studies and bathrooms to maximize your spaces. 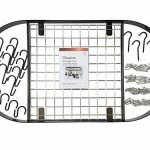 ✔[PERFORMANCE GUARANTEE] Such black pan rack is crafted by heavy duty wrought iron (corrosion problems free) with six rails for storing by category. ✔[INSTRUCTIONS] The pot hanger is wall-mounted. All hardware is included and 10 hooks are additionally provided. ✔[SAFETY ASSURANCE] It can withstand a weight of 30-40lb due to its dimension(23.6 in x10.2in x 7.9in) and durable construction. ✔[MULTIPURPOSES And SATISFICATION GUARANTEE] It is also elaborately designed to store larger items above the rails. You can buy it confidently for the quality is guaranteed and 24-hour after-sales support is always here for you!